Seattle University School of Law will host the first annual Civil Procedure Workshop, co-hosted by the University of Washington School of Law and the University of Arizona Rogers College of Law, July 16-17, 2015. Abstracts are due by Dec. 15, 2014. The Workshop will give both emerging and established civil procedure scholars an opportunity to gather with colleagues and present their work to an expert audience. We hope the Workshop will strengthen the study of procedure as an academic discipline. By assembling annually, colleagues will have regular opportunities to meet to exchange ideas, to collaborate, and to participate in a national conversation on civil procedure scholarship. 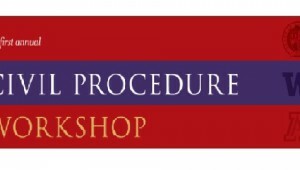 See 2014-Civil-Procedure-Workshop-CFP 2014 Civil Procedure Workshop CFP.